Just a couple of mates, discussing the football. I’ve been thinking about this post for a couple of weeks. It started with the death of Cooper Ratten, the 16-year-old son of Hawthorn assistant coach and former Carlton player and coach Brett Ratten, in a collision where it’s been reported the driver is believed to have been alcohol affected. Young men in such a hurry. Rarely does it end well. Then I thought about it again today when I heard that Hawthorn captain Luke Hodge had been caught drink driving. While the level of alcohol in his blood was considered low range, I thought it was pretty disappointing behaviour from one of the league’s most prominent players. It’s just sheer stupidity, no matter which way you look at it. I like Hodge; despite the fact he just about broke one of Port Adelaide’s star player’s neck by ramming it into a goal post the other week, I’ve always admired him. My initial thoughts – aside from the sheer stupidity of the act that I previously mentioned – was that it probably wasn’t the best look for a player currently serving a suspension to be out drinking, especially when his team is heading into finals. When I heard the club wasn’t going to impose any penalty on him I was again disappointed. I’m not one of those people who thinks that footy clubs should just focus on footy, I think they absolutely should be agents of cultural and social change. Here was a chance for Hawthorn to stand up and say this behaviour was unacceptable from one of their players and more broadly, unacceptable in society, and they missed it. It wasn’t until a friend raised it that I considered the juxtaposition of Hodge and Ratten. “How can Luke Hodge walk into that club and look Brett Ratten in the eye after his son has just been killed by a drink driver?” my mate asked me. I honestly hadn’t thought about it but a quick scan of social media showed plenty of other people were considering it. I don’t know what the answer is but there is such unhappiness entangled in both situations and the way they will intersect. I wrote the below piece about seven years ago and while it has absolutely nothing to do with football, it just feels right to put it here, right now. We were in the kitchen, discussing incidents that had happened in our neighbourhood; all the things that went on in the dark hours of the night which I had previously been unaware of. Psych patients that cut into the soles of their feet, a boarding house only several doors down from us that was home to residents of questionable gender, a bloke who had gotten behind the wheel after a few too many drinks and driven himself into serious injury. I mentioned a fatal crash that had happened almost right in front of our house, one rainy night months ago when I had been driving home late to watch a rugby test. I’d been unable to turn on to my street, stopped by a young officer in a long neon yellow coat standing amongst a litter of traffic cones, lit up by the blue and red flashing lights. I’d parked the car and run down to the scene, the water soaking through my thin shoes. I was peering up through my hooded anorak at what lay before me – debris scattered all across the road. Simple, everyday things like a shoe and a kids bicycle, lying there amongst the glass and torn metal. I remembered being struck by how incredibly unflinchingly ordinary those things looked in that situation. The car itself was sitting in the middle of the road. It looked like someone of enormous strength had picked it up and tried to compress it into a smaller version of itself, with the top and sides pushed in as though it was made of nothing but putty. There was a blue tarp lying over it, flapping gently on account of the weather as people moved about the area. On the other side of the road was a high concrete fence, the substantial kind that looks as though it is made of solid brick that someone iced with creamy concrete. There are no gaps in it and it’s one single entity that stretches for the length of the yard of the house it belongs to. Down the middle of it there was now a crack going from top to bottom, with the right side of the structure pushed back so it was no longer even. Black marks screeched from the fissure across the pale concrete, like the kind of marks you get when you’re moving furniture and you scrape the wall. That whole fence will have to go, I thought. I stopped to talk with several of the officers, introducing myself. Lucky it happened on a Saturday night I said, it means you can go about your work without interference. They nodded, grumbling quietly about the weather and lack of support from other units. When I asked what they thought had happened, one of them said they’d simply been going too fast along the road, hit the dip at the intersection then lost control on the wet road. How old were they, I enquired. Only young, the officer said, both males but impossible to tell the age of the one killed. Too badly hit. The other – the passenger – had gone to hospital. I thanked them, said good luck and walked the 200 metres back to my house. My flatmates were inside watching the rugby. Did you hear anything, I asked? Someone has just killed themselves outside our house. One of them raced out and came back inside after several minutes. We kept watching the rugby. The next day there was nothing in the paper except for a few brief lines hidden away on a late page to signify what had happened. I drove past the spot on the road where the crash had occurred and there was nothing there. The glass and metal swept away, the bike and shoe disposed of, the vehicle towed to a yard somewhere. No one would know what had happened there less than 12 hours previously, with only the cracked fence left as an epitaph to a young man’s stupidity. I checked on Monday and read the names of the two young men from the northern suburbs who had been in such a hurry to get somewhere. The days passed and there was still nothing at the site – no floral tributes left below the fence or wrapped to a light pole with yards of sticky tape. No photos and no crosses. Nothing. The fence is still not fixed. So we were talking about this ‘accident’ and he remembered it, hadn’t been there but remembered it. I remarked that it was strange no one had stepped forward to recognise the dead and he said, “yeah, they were crooks.” I remembered the names I read, initially I had thought they might be internationals with no local family but the names had been traditional mid-eighties Australian like Jason or Darren or Damien. “Ah,” I replied, “crooks,” and nodded my head. We left it at that. Every single day, people are killing themselves and others on our roads and we cannot seem to shake ourselves from the lethargic acceptance of this situation, or change our behaviour in order to stop it. “Was it for this the clay grew tall? What we’re talking about this week – Round 6. 1. Hodge and Lewis – Honestly, I thought Hodge would get one and Lewis three, however despite the guilty plead the captain copped three at the MRP and Lewis got an automatic two. Both incidents were pretty grubby despite the apologies that followed, and certainly not what you would expect or hope from players in a team that’s been back-to-back premiers. 2. 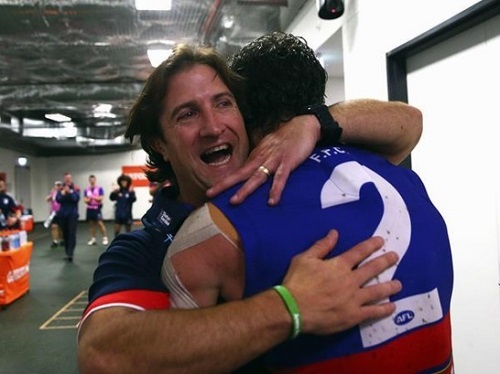 The Doggies – After a brilliant win against the Swans, Western Bulldogs are the talk of Melbourne. They’re looking pretty good after just five rounds and hopefully new coach Luke Beveridge can keep them going. 3. The covered up race – They’re not happy at Port Adelaide after the Geof Motley race was covered up during the weekend’s Showdown, a game that was technically the Crows’ home match. Motley is a Port Adelaide legend and his name, along with both Port Adelaide logos, is on a sign at the top of the exit. Under a deal the AFC has with Adelaide Oval no Port signage is to be seen during Adelaide matches (and to be fair vice versa), however the covering up of the race just came off as petty. 4. Gambling – Apparently around 30 current players have gambling problems. Bored young men with a lot of cash can make for poor decisions. I think clubs need to work hard to ensure they’re educating players to make better decisions and leadership groups that are aware of people with problems really need to confront it. 5. Queensland – If anyone knows what’s actually going on with footy up there, let us know. We have NFI.